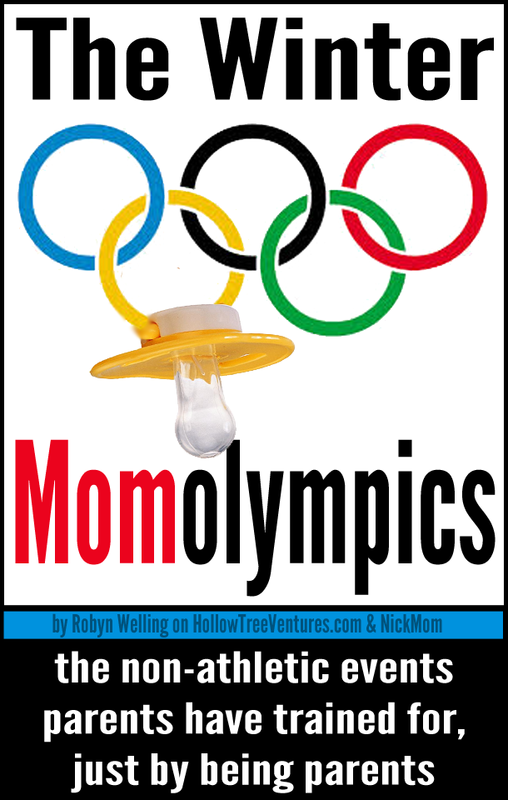 If you were here a couple years ago, you might have been on my team for the Summer Momolympics - a sporting extravaganza for which parents have been inadvertently training since day one of pregnancy. I created the Momolympics (also open to dads, but Parentalolympics had too many syllables) in 2012 because all the fitness freaks - excuse me, Olympic athletes - were making me feel bad about my Snickers-honed physique and non-world-renowned accomplishments. However, as usual all my problems were solved with sarcasm, when I realized that we non-Olympians (or "normals," as I like to call us) were perfectly suited for our own summer athletic parenting events, such as Unsynchronized Swimming and Freestyle Baby Wrestling. Well, now the Winter Olympics (and its competitors, with abs so ripped you can see them through their snowsuits) are upon us like a festive, patriotic, ego-crushing plague, so I decided to open try-outs* for the Winter Momolympics! *Try-outs will be held in a reclined position on the couch, with your choice of adult beverage or gallon of Ben and Jerry's. Or both. So grab your equipment (wine sippy cup, worn-out yoga pants and fruit snacks to distract the kids) and check out these Winter Olympic-style events, tweaked just for parents on NickMom!